The photograph of Charles Stark was reproduced from a tintypecurrently in the possession of Jeffrey Charles Hughes. According to his Civil War pension file, Charles Stark was born about 1845 in Dusseldorf, Germany, immigrating to America before the outbreak of the war between the states. I have found in “Germans To America,” Volume 13, page 303, a listing for Carl Stark, age 18, merchant, from Westphalia, going to Baltimore, Maryland. This passenger was on the ship Columbia from Bremen and arrived on September 15, 1860 in Baltimore. I have found that Charles was listed as Carl Stark on his marriage certificate. This could be our man! It is thought that Charles was living in Pittsburgh, Pennsylvania before he mustered into service at Wheeling, (West) Virginia on June 14, 1861 at the age of nineteen as a private. He was a private in Captain T. Gibson, Jr.’s Company, 2nd Regiment, Virginia Foot Volunteers. On August 1, 1861 this regiment changed to Co. D, 2nd Regiment Virginia Infantry. In March, 1863, Charles was promoted to Corporal. In July, 1863 the regiment became Company D, 2nd Regiment Mounted Infantry. Charles mustered out on January 4, 1864 in Martinsburg, West Virginia and was paid $100.00. He re-enlisted as a veteran volunteer on January 5, 1864 with the rank of Corporal in Company D, 5th Regiment West Virginia Cavalry. On April 15, 1864 he was promoted from Corporal to Sergeant. Charles mustered out in Wheeling, West Virginia on June 16, 1864 and re-enlisted as a Sergeant in Company H, 5th Regiment West Virginia Cavalry. This regiment was not a mounted unit. On August 20, 1864, Charles was absent in arrest and was reduced in rank to private until October 15, 1864 at which time he was promoted to the rank of Sergeant. 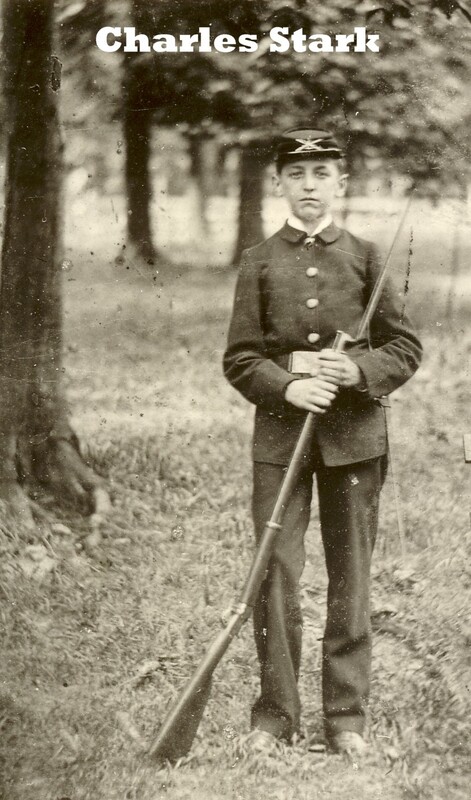 In November, 1864, Charles joined New Company H, 6th Regiment West Virginia Cavalry as a Sergeant. No other West Virginia regiment has a more interesting history than the New Company H. Following the war the regiment did provost duty in Washington DC until they were moved to Fort Leavenworth, Kansas and then further west to the Territories of Dakota and Colorado. Its headquarters in the winter of 1865-1866 was Fort Laramie. The Regiment was several times engaged with the Indians and was highly complimented for its gallantry. During his time in the west, Charles was reduced in rank to private as he was absent in arrest three times--from July to August he was absent from Fort Leavenworth, Kansas; in September he was absent enroute to Fort Laramie from Fort Leavenworth; and in October he was absent from Fort Leavenworth to Fort Casper in the Dakota Territories. Charles mustered out of service at Fort Leavenworth, Kansas on May 22, 1866. According to the Civil War pension file, Charles was a short man of five feet, three inches, with blue eyes and fair hair. His occupation is listed as clerk and his birthplace is Elperfelt, Prussia and Dusseldorf is listed. Following his service, Charles returned to Allegheny County, Pennsylvania. He has a listing in the Pittsburgh City Directories from 1869 on. Charles applied for naturalization papers in Allegheny County, Pennsylvania and on October 5, 1872, he became an American citizen. On April 27, 1874 he was inducted into the Allegheny Lodge 223 of the Masons. During this time, Charles was employed as a shoe salesman in the city of Pittsburgh. In February, 1878 he traveled to St. Louis, Missouri where he was married to Wilhelmine Catherine Schwarz, of Goppingen, Wurttemberg, Germany on February 6, 1878. The ceremony was performed by Ch. (Charles) F. Stark, pastor of the Evangelical Bethlehem Church. Rosetta Stark was the witness. Charles Stark is listed as Carl Stark of Elberfeld, Prussia. 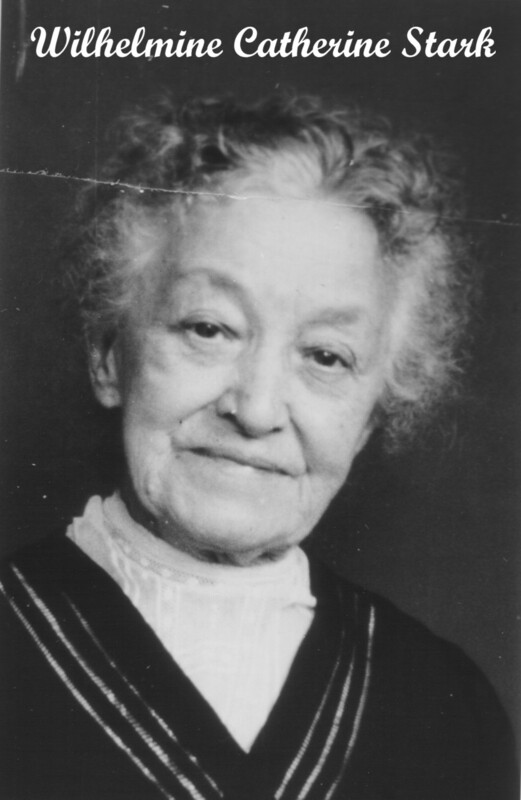 I have been told by family members who knew and lived with Wilhelmine “Granny” Stark, that she came to America alone. The wedding had been arranged and she immigrated to marry Charles Stark. Stories regarding Wilhelmine are confusing and yet a thread of commonality runs through them. She was known as “Schwarz” or “Noir”. She was born on August 25, 1851 in the Bordeaux region of France and spoke French fluently. In fact, she taught a number of her grandchildren to speak the language. It is said that her mother was born in Germany and that her father was a surgeon from the Alsace-Lorraine region. This could account for the two different surnames. Both translate to “Black” depending on which language is used. The same grand daughter remembers that Granny Stark wrote letters to Europe to cousins who owned a chocolate factory. Following their marriage, the Starks returned to Allegheny County and on the 1880 census they are living in Allegheny City and both were born in Baden, Germany. Charles is employed as a shoe salesman and a son, Charles age 1, has been born. Here begins a mystery. Charles (Edward Stark), my grandfather, always used the date, September 23, 1880, as his birth date and yet, according to the census report, he was born around June, 1879. Again, family stories might clear up the mystery. A grand daughter of Charles and Wilhelmine can remember that they had a son, named Theodore, who died as an infant or young boy and was buried in Uniondale Cemetery. She can remember visiting the grave, however, I have not been able to locate any burial records for a Stark child in Uniondale. Perhaps the birth date September 23, 1880 was mistakenly given to my grandfather, Charles Edward Stark when Theodore died and it was actually Theodore who was born in 1880. The Starks moved back to Allegheny City in 1888. On April 15, 1890, Charles Stark was sent to the City Home following a court decision that legally declared him to be a lunatic. Charles is enumerated in the 1890 Special Census for Civil War Veterans and Widows on page 5, ED 228, Allegheny City, Pennsylvania. The census was done on June, 1890, so Wilhelmine probably took his service papers to the officials. He died of paralysis on April 26, 1895, at the age of fifty, in the City Home and his body was taken by friends to the undertakers. He is buried in Uniondale Cemetery in an older section along Marshall Avenue. Great grandson, Jeffrey Charles Hughes has visited the site and replaced the small American flag beside the tombstone. When Charles died he left a widow and five young children: Charles, age 15; Emily, age, 13; Alfred, age 11; Lucy, age 9; and Dorothy, age 7. It is difficult to know what type of income Wilhelmine had at her disposal to raise her young family. She worked at home doing seamstress work for neighbors and received her husband’s monthly war pension. A fellow Mason, Jacob Colmer, was appointed guardian of the children following Charles’ death. In 1894, Wilma moved her family to Avalon, Pennsylvania. By 1899 both Charles and Alfred were employed as clerks and were of assistance financially to the family. The Starks moved frequently within the borough of Avalon at the turn of the century. During the majority of her lifetime, Wilhelmine’s children lived in the Avalon area. She stayed with her daughter Lucy Stark Munger until her daughter Dorothy Stark Cooper’s husband died in 1926, after which time Wilhelmine shared an apartment in Avalon with Dorothy and her two daughters. Wilhelmine died of pneumonia on March 27, 1940 in Avalon, Pennsylvania, at the age of eighty-eight. Against the wishes of her son, Alfred Walter, the family buried her in Uniondale Cemetery in Section B. Her youngest daughter, Dorothy Stark Cooper is buried beside her. CHARLES EDWARD STARK, born September 23, 1880 in Allegheny City, Pennsylvania, died January 24, 1945 in Bellevue, Pennsylvania, married MARTHA MARIE FREDERICK on June 10, 1914. Amelia (Emily) B. Stark, born July 29, 1882 in Pittsburgh, Pennsylvania, died June 15, 1956 in Pittsburgh, Pennsylvania, married Howard H. Miller. Alfred Walter Stark, born May 15, 1884 in Pittsburgh, Pennsylvania, died about 1950 in Miami, Florida, married Frances Unknown. Lucy W. Stark, born November 2, 1886 in Pittsburgh, Pennsylvania, died January 27, 1927 in Bellevue, Pennsylvania, married Montgomery (Mont) M. Munger. Dorothy Marie Stark, born December 15, 1888 in Allegheny City, Pennsylvania, died January 26, 1964 in Pittsburgh, Pennsylvania, married Thomas Craig Cooper. Obituary of Wilhelmine Schwarz Stark submitted to Rootsweb.com, Allegheny County, Pennsylvania Archives by Linda Hughes Hiser. A special thank you to my mother, Martha Stark Hughes, daughter of Charles Edward Stark and to Dorothy Cooper Richards, daughter of Dorothy Stark Cooper, for lovingly sharing their family memories, photographs, and momentos. Also to my cousin, Kent Kretzler, grandson of Emily Stark Miller, who has found and scanned many early Stark family photos, especially those of Wilhelmina aka "Granny Stark". Unlock the Stark Treasure Chest!